Hue and Cry was directed by Charles Crichton, associate producer Henry Cornelius, written by TEB Clarke. Photographed by Douglas Slocombe, Art direction Norman G Arnold, music composed by Georges Auric and edited by Charles Hasse. The cast were Alastair Sim, Jack Warner, Valerie White, Jack Lambert, Harry Fowler, Frederick Piper, Vida Hope, Gerald Fox, Grace Arnold, Joan Dowling, Douglas Barr, Stanley Escane, Ian Dawson, Paul Demel, Bruce Belfrage, Joe E Carr, Robin Hughes, Howard Douglas, Heather Delane, David Simpson, Albert Hughes, John Hudson, David Knox, Jeffrey Sirett, James Crabbe, Alec Finter and Arthur Denton. Harry Fowler (Joe) is the head of an East End gang of children who suspect that a gang of criminals is using their favourite comic, The Trump, to set up crimes. Joe is taken in by a bogus policeman who finds him a job as a porter with a local businessman, little does he know that his boss is the criminal he is chasing. After a meeting with the author of The Trump stories Felix H Wilkinson - (Alastair Sim), Joe and his gang set a trap for the criminals but are themselves set up and have to escape through the sewers. They change tactics and follow a woman who works for the comic's publisher. They capture her and force her to talk by torturing her with a pet mouse. Joe persuades Wilkinson to rewrite the end of the story and they set up the gang of criminals. The story ends with a massive fight sequence set on a bombed out wharf in the Pool of London. The criminal gang is captured. The Cinema 1947 "...Michael Balcon, production head of Ealing Studios, has completed two further pictures due shortly for general release and which maintain Ealing's tradition for producing films that are different. One is Hue and Cry directed by Charles Crichton, with O.H. Cornelius as associate producer, which Michael Balcon describes as an experiment in film-making. 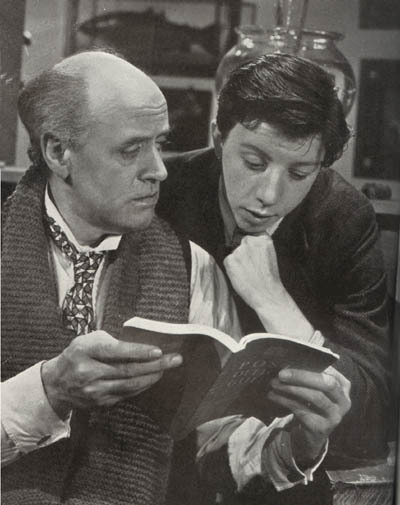 Although well-known stars like Jack Warner, Alastair Sim and Valerie White head the cast the main characters are composed of a group of children. It is an adventure relating the fantasy of popular 'penny bloods' to a credible situation in reality, the story of a schoolboy thriller which comes to life. It is calculated to appeal to youngsters and adults alike." Hue and Cry is a wonderful comedy with many sly touches of humour - even the credits are funny. The film opens and closes with the main characters (the children) singing in a church choir, looking very angelic, which contrasts sharply with their behavoiur out of church. There are stunning views of London throughout the film, mainly of the city and the bomb damaged East end, but also Hampstead where the gang leader has a home. The performances by all are very good, the film is headed by the children and the adults really are supporting roles, even so Alastair Sim steals the film with his portrayal of a rather timid adventure story writer. Jack Warner is against type as the arch criminal. An excellent film which marked the beginning of Ealing's 'Golden Era'.